In a difficult year for the NASL in the Open Cup, the Cosmos were the only NASL side to advance to the Round of 16. Seven of the second-division sides fizzled out in their opening matches and the Silverbacks were bounced out of the fourth round by the New York Red Bulls. The Cosmos met Jersey Express in the third round, sending the PDL side home in a 3-0 shutout. Goals from Leo Fernandes, Sebastian Guenzatti, and Mads Stokkelien would move the Cosmos into the next round. The sole blemish on the performance was the red card received by center back Samuel Caceres in the 90th minute while committing a foul to preserve the shut-out. 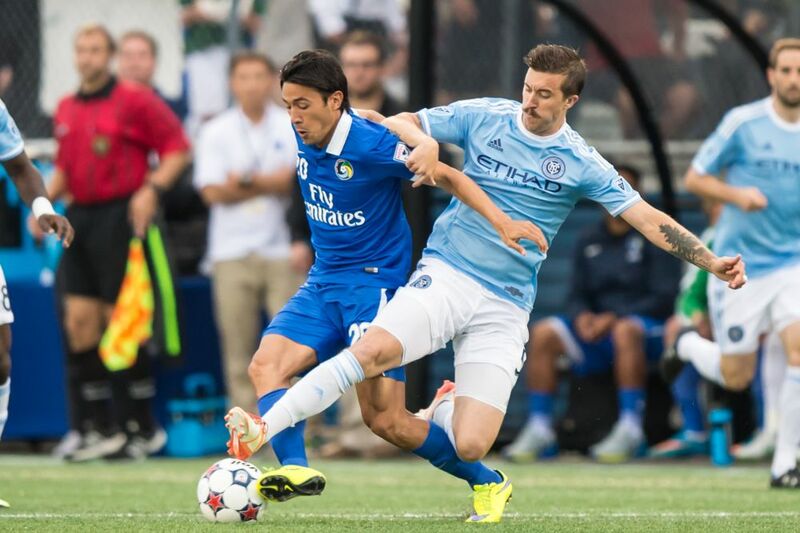 The Cosmos next hosted NYCFC in the first-ever derby between the two sides, currently known as the East River Derby. Opening the scoring in the first half, NYCFC took a 2-0 lead shortly after halftime courtesy of a pair of Kwadwo Poku goals. An incredible comeback would play out as the infamous “Cardiac Cosmos” made another appearance. A goal in the 65th minute by Leo Fernandes goal gave hope and a 90th minute Lucky Mkosana goal granted temporary salvation to the home side forcing extra time. A controversial penalty kick awarded to the MLS side in extra time seemed to indicate the end of the Cosmos run until it was put into the crossbar and cleared. The final act would involve penalty kicks and Cosmos goalkeeper Jimmy Maurer becoming a club legend as NYCFC failed to convert three and defender Hunter Gorskie scored the game winner. An unpleasant reality that Cosmos fans faced was that their club barely squeaked by one of the worst teams in MLS, without facing the likes of David Villa, Frank Lampard, or Andrea Pirlo (granted the Cosmos were missing starters of their own, like Marcos Senna and Roversio). It should also be noted that the expansion MLS side had started to gel and had strung together a pair of league wins prior to the Open Cup showdown. However, serious questions were raised as they entered the fifth round against a Red Bulls squad that was clearly taking the Cup more seriously than they had the year before. In 2014, a lackluster performance resulted in a 3-0 thrashing by the Cosmos 3-0. This year, however, their intentions were clear as they fielded a strong squad against the underperforming Silverbacks, who they wiped out 3-0. With Red Bulls hosting the Cosmos in the fifth round, it was inevitable to remember the year before, when the Cosmos found themselves on the wrong end of a controversial 2-1 loss after extra time in Philadelphia. They intended to avoid the same result. And they did. But not in the manner hoped for. The concerns began when the line-up was released. Hunter Freeman (RB) and Samuel Caceres (CB) were announced in the starting XI, with defensive stalwarts Roversio and Ayoze unavailable. Roversio’s omission was not entirely a surprise with injury having kept him off the pitch, but Ayoze’s absence came as a shock to most. In fact, the only sub the back line had available was David Diosa, who had been repurposed as a defender just this preseason after playing as an attacking mid. To add to the concerns, Raul started the game on the bench, recovering from a knock, while Andres Flores started as the center attacking mid, a role he was not suited for. The return of Marcos Senna from injury was welcomed, but not enough to offset the concerns of the back line in particular. Red Bull started the game on a fast pace and the Cosmos struggled to weather the storm. It would pay off for the home team as they scored their first goal in the fifth minute. Freeman was nowhere to be found as Sal Zizzo sat wide open in the box to put a head on a Lloyd Sam cross and open the scoring. Mkosana managed to find an equalizer in the 16th minute. Great ball distribution by Jimmy Maurer, a clever dummy and an excellent run by Walter Restrepo led to his pass into the box that was poorly cleared to the foot of Fernandes. Fernandes sent it to Mkosana who buried it past Luis Robles to even the score. The Red Bulls answered with more pressure, including another goal by Zizzo that was called offsides, before finding a go-ahead in the 42nd when Anatole Abong found space behind Senna and got over Freeman to score a header off a Sacha Kljestan corner. The Cosmos nearly found another equalizer when Raul entered at the half and just missed on scoring a Fernandes through ball that slid across the mouth of the net. The Red Bulls widened the gap in the 54th minute after a defensive error to clear a ball, followed by a Gorskie foul in the box led to a penalty kick converted by Kljestan. Another chance would escape the Cosmos in the 63rd minute, when a Raul header bounced off the crossbar and back to Mkosana who put another shot off the upright and then mishit the rebound. The final Red Bull goal added insult to injury as Mike Grella went one on one with Gorskie, leaving him on his back, before beating a sliding Carlos Mendes and diving Maurer. Overall, the Cosmos had a difficult time keeping up with the pace of the Red Bulls. Defensively, they looked unconvincing and they were unable to keep control of the midfield. For a club with two weeks of rest playing against a club seeing four games in ten days, the Cosmos looked like the tired side and with only two shots on goal, the Cosmos did not pose enough of an offensive threat. With the fall season starting back up for the Cosmos on, it remains to be seen how the Cosmos will react to the loss. The Open Cup loss last season seemed to make the NASL fall season fall apart for them as they finished in 6th place, dropping 14 points at home. The question now is which Cosmos will play this fall: the Fall 2014 side or the Spring 2015 champions?